CAMBRIDGE, MASS.–A new approach to analyzing and designing new ion conductors — a key component of rechargeable batteries — could accelerate the development of high-energy lithium batteries, and possibly other energy storage and delivery devices such as fuel cells, researchers say. 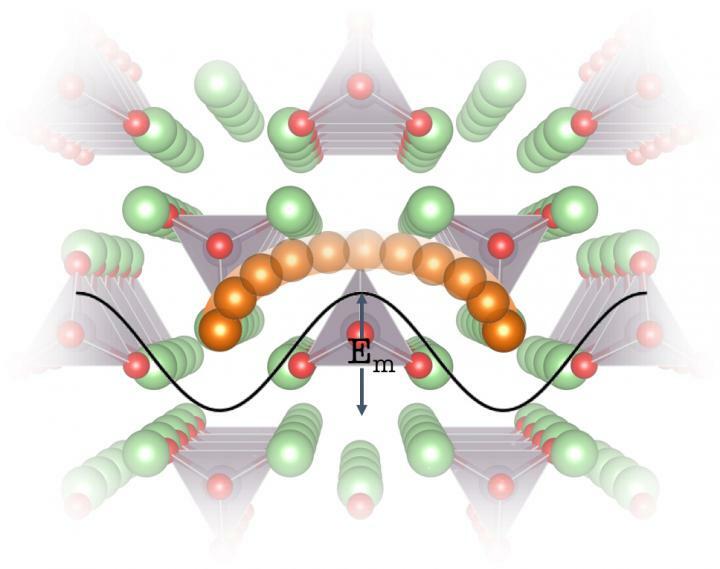 The new approach relies on understanding the way vibrations move through the crystal lattice of lithium ion conductors and correlating that with the way they inhibit ion migration. This provides a way to discover new materials with enhanced ion mobility, allowing rapid charging and discharging. At the same time, the method can be used to reduce the material's reactivity with the battery's electrodes, which can shorten its useful life. These two characteristics — better ion mobility and low reactivity — have tended to be mutually exclusive. The new concept was developed by a team led by W.M. Keck Professor of Energy Yang Shao-Horn, graduate student Sokseiha Muy, recent graduate John Bachman PhD '17, and Research Scientist Livia Giordano, along with nine others at MIT, Oak Ridge National Laboratory, and institutions in Tokyo and Munich. Their findings were reported in the journal Energy and Environmental Science. The new design principle has been about five years in the making, Shao-Horn says. The initial thinking started with the approach she and her group have used to understand and control catalysts for water splitting, and applying it to ion conduction – the process that lies at the heart of not only rechargeable batteries, but also other key technologies such as fuel cells and desalination systems. While electrons, with their negative charge, flow from one pole of the battery to the other (thus providing power for devices), positive ions flow the other way, through an electrolyte, or ion conductor, sandwiched between those poles, to complete the flow. Typically, that electrolyte is a liquid. A lithium salt dissolved in an organic liquid is a common electrolyte in today's lithium-ion batteries. But that substance is flammable and has sometimes caused these batteries to catch fire. The search has been on for a solid material to replace it, which would eliminate that issue. A variety of promising solid ion conductors exist, but none is stable when in contact with both the positive and negative electrodes in lithium-ion batteries, Shao-Horn says. Therefore, seeking new solid ion conductors that have both high ion conductivity and stability is critical. But sorting through the many different structural families and compositions to find the most promising ones is a classic needle in a haystack problem. That's where the new design principle comes in. The idea is to find materials that have ion conductivity comparable to that of liquids, but with the long-term stability of solids. The team asked, "What is the fundamental principle? What are the design principles on a general structural level that govern the desired properties?" Shao-Horn says. A combination of theoretical analysis and experimental measurements has now yielded some answers, the researchers say. "We realized that there are a lot of materials that could be discovered, but no understanding or common principle that allows us to rationalize the discovery process," says Muy, the paper's lead author. "We came up with an idea that could encapsulate our understanding and predict which materials would be among the best." The key was to look at the lattice properties of these solid materials' crystalline structures. This governs how vibrations such as waves of heat and sound, known as phonons, pass through materials. This new way of looking at the structures turned out to allow accurate predictions of the materials' actual properties. "Once you know [the vibrational frequency of a given material], you can use it to predict new chemistry or to explain experimental results," Shao-Horn says. The researchers observed a good correlation between the lattice properties determined using the model and the lithium ion conductor material's conductivity. "We did some experiments to support this idea experimentally" and found the results matched well, she says.